Last month, we received a package from Q-Depot, a Korean cosmetics online shop that sells Korean makeup and skin care products. It appears that they send sample products to prominent bloggers around the world to test and write about their goods. 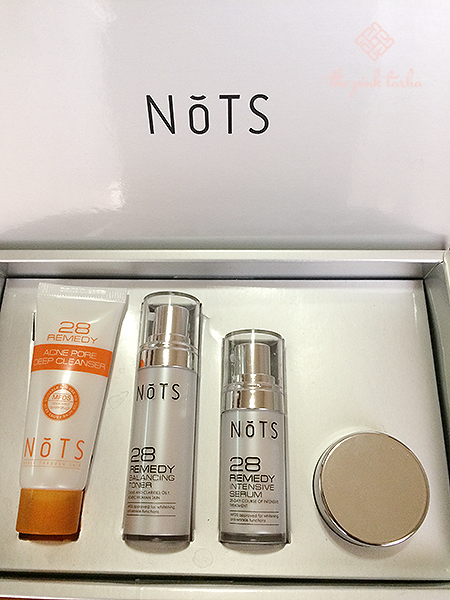 Since J had just recently purchased her own beauty regimen set, she offered to put me up to the challenge of trying out the contents of the said package: the NoTS 28 Remedy Perfect Solution 4 Set. 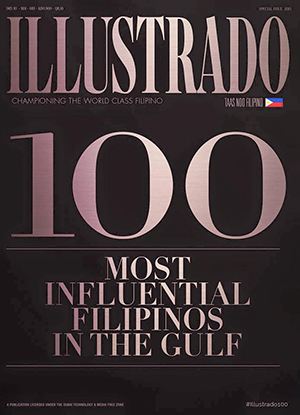 The packaging is very minimalist with a glossy, silver box; the brand printed out in sans serif black font. 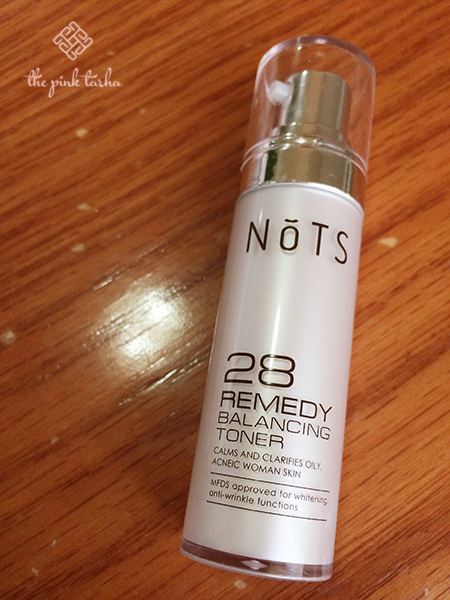 I slid out the contents to find four small items labeled as the 28 Remedy: Deep Acne Pore Cleanser, Balancing Toner, Intensive Serum and Repair Cream. I looked for more extensive product descriptions than those noted in each bottle, but I only found a bunch of text at the back of the box that was in 90% Korean. Thus, I had to look them up online to know how I was going to use them and what promise do these beauty creams hold. 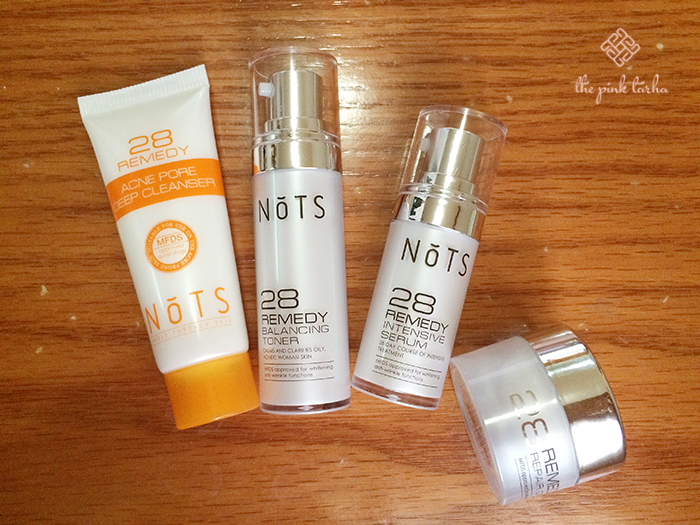 After a brief background check online, I learned that NoTS 28 is a Korean skincare regimen that aims to change your skin in 28 days, ergo the numerical value in its name. 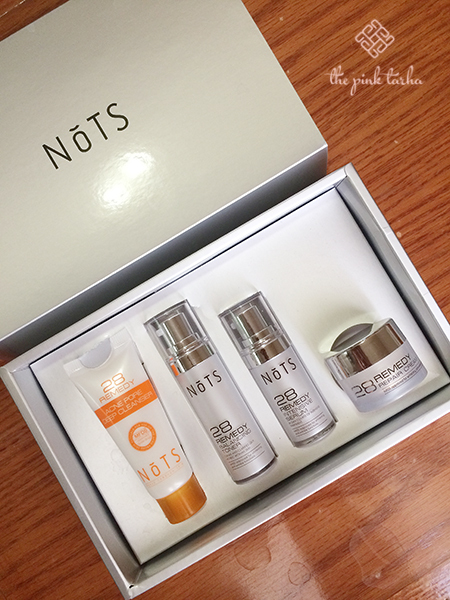 NoTS is an acronym for “Noble Through Skin” and is a rising brand competing with other Korean drugstore names. 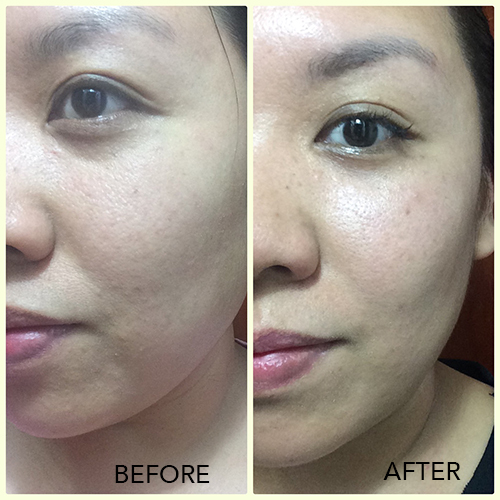 I was intrigued to see if I will achieve porcelain-looking skin after 28 days so I started using the products religiously, every night, for almost a month. Here’s my experience on each product. This bottle stood out amongst the rest mainly because it’s packaging was in a bright orange and white tube. The content was very concentrated and had a mild “medical” smell to it (nothing too unpleasant, it’s just that the scent doesn’t seem to aim to please). 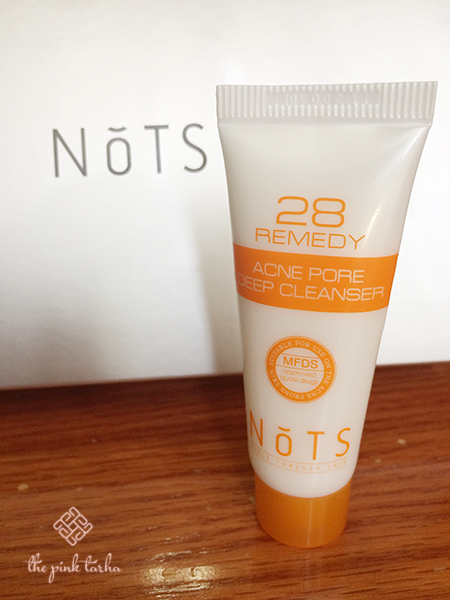 A 25 mL facial cleanser. However, its cleansing functions were impressive along with the longevity of a tiny 25mL bottle that lasted well beyond the 28 days. Because it’s concentrated, a little dollop goes a long way. My face felt a bit dry after the wash but then again, I had to apply the rest of the remaining products on anyway so I didn’t mind. It is supposed to “calm and clarify oily, acneic, woman skin” according to the product description on the bottle. I don’t know about being “acneic” but I do know that I have a generally oily face and I am a woman with skin so I guess this would suit me. 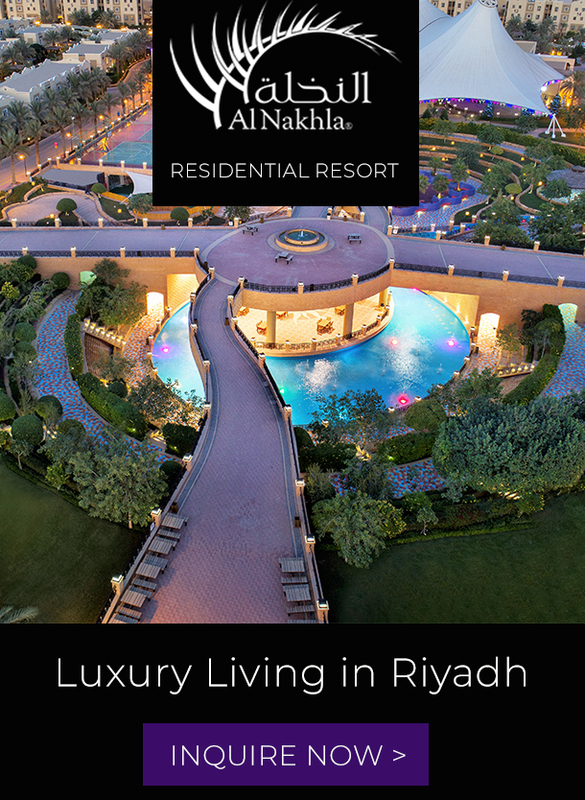 The product is light and transparent with a gel-like consistency. However when I applied it all over my face, it felt watery (not sticky). I’d let it dry off for a couple of minutes before I apply the next product. This particular product is one of the propellers of the “28-day intensive treatment” and targets wrinkles and helps in whitening/brightening. It also comes with a pump applicator (like the toner) and has a gel-like consistency. 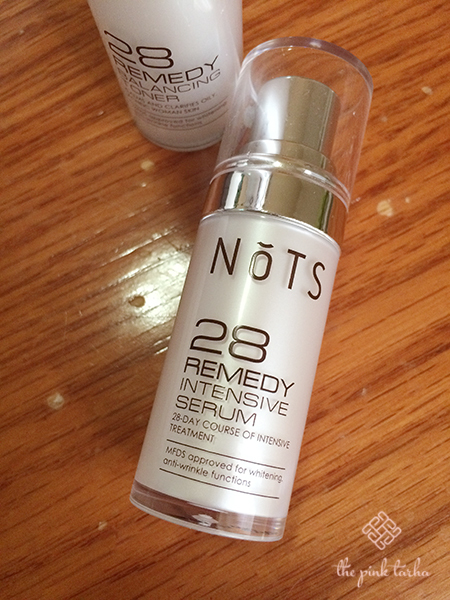 Serum for anti-wrinkles and whitening. However, this isn’t as watery when applied compared to the toner and is in fact a bit more concentrated. 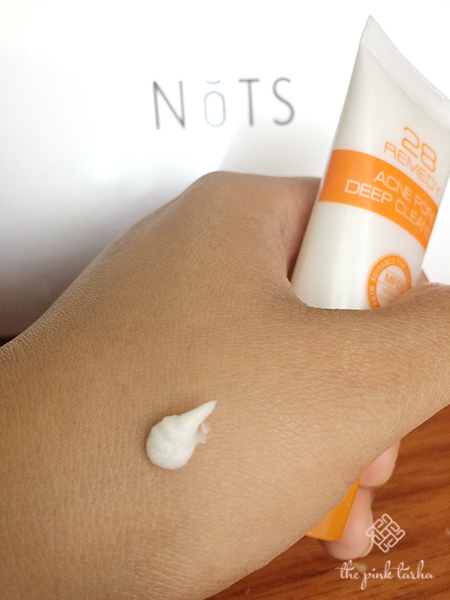 It is also only 12mL so I paced myself when using it and only applied it to the areas of my face that are prone to wrinkles: around the eyes and the forehead. I have to say that of all the products, this was the one with the most pungent scent. It is an herbal/medicinal smell that lingered while it sits on your face. It comes in a 10g in a 30g jar and is a think cream that is very, very sticky. A bit too smelly for me. 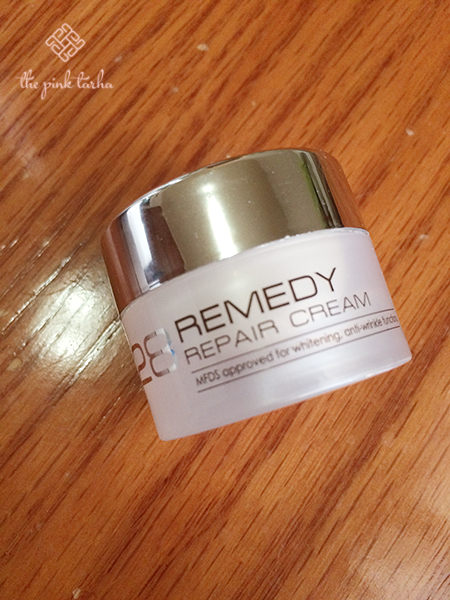 According to the description, it is also for anti-aging and whitening therefore given the small portion of product available, I used this as economical as I can to last me 28 days. Based on my observations during and after the 28+ days of using it, I noticed that I did not develop any pimples throughout the process (and I usually get pimples at least once a month). My face looked clearer and brighter even without makeup on. It still wasn’t Korean poreless, porcelain skin but I felt nourished and clean in general. The downside for me is mainly that the descriptions and contents were hardly in English and I want to be able to know that off the bat. Not bad for a sample set. More than anything, it did get me interested in checking out the rest of the Korean cosmetics and makeup that they had to offer in their online shop. I know that we’re of the Asian persuasion and sometimes its really admirable how Koreans are able to maintain such type of skin. Maybe it’s part genes, part skincare routine. Who knows? 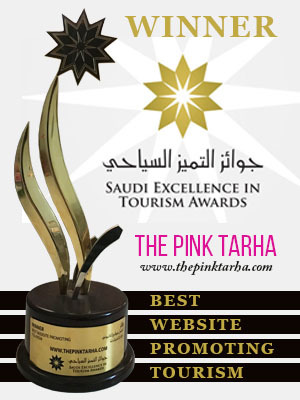 Well, we just have to keep on trying and studying which products will work best for us.